You asked and we listened! New to Kava Kava? Try the Kava Kava starter pack. Our Kava Starter Pack Includes 1/4 lb bag of Mahakea Powdered Kava Root, a Reusable Muslin Extraction Bag, 1 oz bag of Instant Cocoa Kava Mix, (6) 30% Kavalactone Capsules, and 10% Coupon on your next order - all inside a reusable Kona Kava Farm tin. New to Kava Kava? Not sure where to start? You asked and we listened! 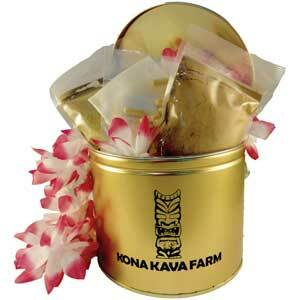 Try the Kava Kava Starter Pack from our friends at Kona Kava Farm. Kava Powder Plus is Kona Kava Farm's strongest Powdered Kava Root. Each rhizome (root) is matured for over four years prior to harvest. That patience is rewarded with a tested kavalactone content of about 10%. Kava Plus also offers a less bitter taste and the most pleasurable effects. * This Kava Kava root is the pride of their family farm, and we offer our 100% Satisfaction Guarantee to any customer who doesn't think this kava is the best they've ever tried. We promise you will acquire a taste for this amazing and versatile herbal product. This Hawaiian kava is ideal for long and pleasant ceremonies that are conducive to sociability and the telling of long stories. These Kavalactone 30% capsules feature Kona Kava Farm's verified 30% minimum Kavalactone extract. These capsules contain expertly blended extract along with soy lecithin to help your system absorb the Kavalactones contained in the capsule. Each 300mg capsule has 240mg of 30% Kavalactone, with 60mg of organic soy lecithin, in a completely vegan capsule. Two capsules give you about 145mg of Kavalactone, for 1/2 of the daily recommended dose, reliably, capsule to capsule.